Kiss goodbye to any hope of mobile productivity with these addictive games. Users of Palm Treo smartphones will already appreciate the pop up that appears onscreen after a call from a new caller, making it easy to add fresh contacts to the address book. Iambic's new YourCall application turbo-charges this functionality, adding a handy post-call dialogue offering a variety of useful follow-up actions after taking a call. 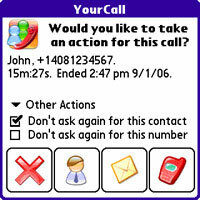 The program (which must be installed into the Treo's built in memory) pops up after every call, with a simplified interface offering four chunky buttons for the most popular actions. Depending on whether the contact is a new one or not, these buttons let you view the contact's full profile, create a new contact from the received phone number, add the number to a current contact or add the contact/phone number to the Palm's daily journal application. There's also the option to call the number back straight back or fire off a SMS, with a drop down menu providing the ability to create a memo, task or meeting and send an email to the contact. Whatever action is selected, YourCall automatically adds relevant info to the entry, including telephone number, contact, length of the conversation and the time/date of the call. Conveniently, you can also set up specified numbers to bypass the dialog, or disable the entire application during specific hours of the day. With its bright and breezy interface, YourCall is a pleasure to use, although to gain the full functionality of the application you'll need Iambic's excellent Agendus PIM software installed. If you haven't got Agendus on your Palm, actions will be limited to the default Palm OS applications. There's no means to specify any third party applications, which is a tad frustrating. During our test, we found the program worked as advertised, although it could seem tad sluggish at times when we asked to add meetings into Agendus. 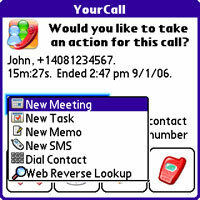 The program was easy to set up and use, we liked the friendly interface and integration with other Palm apps, and for power users who rely on their phone for their working life, we could see that YourCall could prove an invalble addition. Memory requirements: 130 KB of free space. Operating System: Palm OS 5.2 or higher. Models Supported: Palm Treo 650, Palm Treo 700p.